Philippe Coutinho has explained how watching Liverpool's dramatic comeback in the 2005 Champions League final left a big impression on him as he reiterated his happiness in his new Merseyside surroundings. The 20-year has already made a big impact at Anfield since joining the Reds from Inter Milan in January, scoring two goals and claiming a couple of assists in five appearances so far. As a youngster in his native Brazil, the No.10 admits he was well aware of Liverpool's reputation - particularly after a 12-year-old Coutinho watched the drama of Istanbul unfold on his television set at home. "Growing up in Brazil I knew all about Liverpool," he told the Liverpool Echo. "It's such a big club all over the world. "I was very young but I remember watching the Champions League final in 2005 when Liverpool came back from 3-0 down to win the trophy. That was unbelievable. "The manager sent me some text messages before I came over from Italy and I spoke a lot with Lucas. He phoned me and told me all about the club. "That gave me the incentive to come over and I know I made the right decision. "The manager has shown a lot of faith in me and hopefully I will repay that. I want to win some titles here to compensate the club for what they've done for me." Coutinho has already began to do just that with his form so far, though he stresses he still has much to learn as he continues to adjust to the rigors and demands of the English game. "Things have gone really well for me here so far," he continued. "Maybe because I played in Italy and spent six months in Spain last season that has helped me adapt more quickly to English football. "Also I must thank my teammates as they have helped me a lot with my first few games. Everyone has made me feel so welcome. "The manager here is still young but he's an excellent person and a very good coach. He speaks openly to everyone and I'm pleased to be working with him. "The games are quicker and more physical but I like that. I am learning all the time. "Every player wants to improve and get better and I am the same. I am still young and have so much still to learn. "I hope to be here for many years and become a big player for Liverpool. I will continue to work hard and do my best to improve my performances and help Liverpool." As part of his settling in process, Coutinho is undertaking English lessons - though coming to terms with the Scouse accent is another proposition in itself, he admits. "Communication between myself and my teammates is still a bit difficult," said the playmaker. "The people here speak very fast so it's difficult to pick up the words but I'm trying. "If the manager wants to get some information across to me in training he speaks Spanish. Lucas has also helped me a lot. "I have been down to the docks and to a few restaurants but away from the club I mostly spend a lot of time at home with my wife." At international level, Coutinho has one cap for Brazil to date - a tally he's hoping to add to if he can continue to impress at Anfield. And the fact the 2014 World Cup finals will be held in his homeland is providing added incentive to force his way back into the squad. 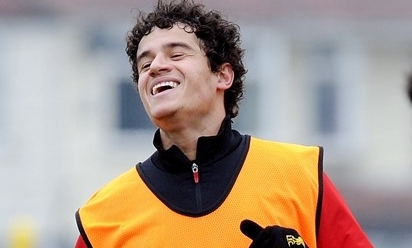 "It was an honour for me when I was called up the first time," reflected Coutinho. "At the moment my aim is to play well for Liverpool and to learn and develop as much as I can. "But I am sure if I play consistently well for Liverpool then the Brazil coach will notice me and I'll be called up for the national team. "Every player has a dream to play for their national team and especially in a World Cup. "The fact the next World Cup is in Brazil makes that extra special. I will try to play as well as I can in order to make the squad. "It's my dream to play for Brazil in the World Cup." He added: "There have been so many great names from my country's past. Players like Pele, Ronaldo, Ronaldinho and Romario. "They are heroes of mine and they are players I am trying to follow in their footsteps. That is my aim but I'm still young and I need to learn a lot." Coutinho's ability was recently compared to that of one of his heroes - Ronaldinho - as well as Barcelona superstar Lionel Messi by Southampton boss Mauricio Pochettino, who managed the Brazilian during a loan spell at Espanyol. "It's always nice to hear such words from a manager you have worked with," said Coutinho. "But I cannot be compared with players like this. I'm honest enough to know I need to learn so much more. "I will try to develop and do my best for Liverpool in order to improve as much as I can. Hopefully one day I will be recognised as a great player like them."